21 cm iii, 380 p.
The greatest motivational book of all time! 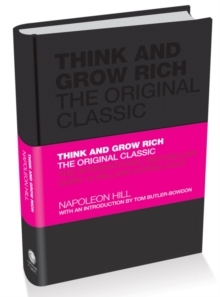 Napoleon Hill's thirteen step programme will set you on the path to wealth and success. Think and Grow Rich reveals the money-making secrets of hundreds of America's most affluent people. By thinking like them, you can become like them. This powerful 1937 classic, with analysis from self-development authority Tom Butler-Bowdon, will continue to be read through the decades of economic boom and bust, proving that the magic formula for making money never changes.